HAWAIIAN BUTTON UP. PIT TO PIT 23 IN. Maker :Hukilau Fashions, Honolulu. Aloha Camp Shirt. Fabric: no listed thinking Nylon. Summa Silk Button Up. Hawaiian Shirt. Shirt is pre-owned in very good condition. 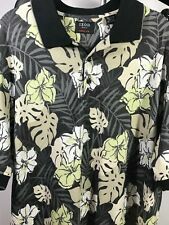 Pre-Owned Hilo Hattie's Hawaiian Short Sleeve Camp Shirt. Color Turquoise, Blues, Green, Black and White. Color: Blue, Ivory Gray, Black. 70% Silk; 30% Nylon. Machine Wash Cold Delicate; Line Dry. Cubavera Shirt Size XL/XG. 100% Viscose Nylon. Very soft, high quality fabric. Beige shirt with large brown floral print. Light floral graphics in background. Arm pit to Arm pit across chest: 26”. Gently used with no flaws. Great condition! This shirt is in excellent condition. Nice addition to you collections. Fabric: 75% Silk /25% Nylon. Size: large. This shirt is in excellent condition, a warm casual clothing during this cold season. Nice addition to you collections. High-end item. Length 28 in. shoulder to shoulder 19 in. Straw huts surrounded with palm trees and sailboats. short sleeve. straight cut style shirt. Single stitching. Smoke free. clean. good condition. rate quality an A-. Material: 60% Cotton 40% Nylon. Main Color: Multi-color. one chest pocket and side vents. Material: 60% Cotton 40% Nylon. HAVE FUN 2D. Main Color: Blue. It's possible a sample might be a limited release, rare, or even unreleased. Color: Breeze Blue. It's possible a sample might be a limited release, rare, or even unreleased. Color: Purple Orange Red. Material: 60% Cotton 40% Nylon. HAVE FUN 2d. Main Color: Multi-color. VTG Sundek Rainbow Hawaiian Shirt. 65% Acetate/ 35% Nylon. Made in USA. Soft nice draping Fabric. Men’s Medium Chest - 21” Length - 26” Excellent Used Condition. Free Shipping. Woodys Huts Palms. Hawaiian beach Island Surf shirt. 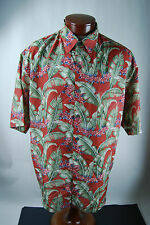 Hawaiian shirt Jimmy Z surfwear. By Jimmy Z. Item: Tommy Bahama Mens Shirt Island Commuter Soft Flamingo LS T318670 New Medium M Size: Men’s Medium Color: Soft Flamingo Smoke Free Home. Returns: Accepted if you're not 100% delighted. Default Message: Some items might be a sample product, which are the exact same as a retail item, but with a sample tag sewn near the size tag. Sometimes, sample products are manufactured to be sent to stores like Macy's to decide if they want to purchase them, and then sent back to Tommy Bahama. Some samples might not include a spare button. It's possible a sample might be a limited release, rare, or even unreleased. King Arthur Vacation Wear. Shirt is in Excellent Used Condition! Ocean City. Atlantic City. 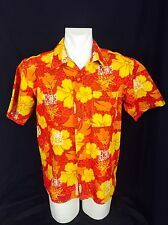 Bumka Bibas Hawaiian style shirt. Color/Design: Off white with light orange/ peach floral design. Size: Large. Material: 74% Cotton; 22% Nylon, 4% Spandex.